Have you ever dreamed of owning that nostalgic, rustic log cabin in the woods? 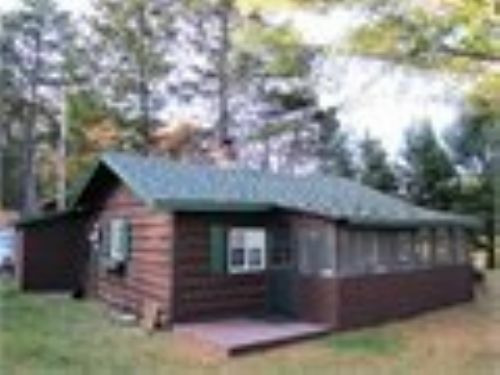 How about owning one on some of the most sought after chain of lakes in northern Wisconsin in the heart of a National Forest for under is an exceptional opportunity for a family on a budget to start making memories at the cabin. This cabin is as solid as a rock, meticulously maintained and has been owned by the same family for over 23 years. They have spent every summer here with their family making memories and are now offering you the same opportunity. The cabin offers everything a family needs to enjoy summers on the lake. You would have 100’ of very level, sand frontage, new screen porch, new roof, new vinyl windows, huge new shed, new wood burning stove and the privacy of a lot lined with white pines. There is a tree on this lot that you will not even be able to wrap your arms around! There are 2 bedrooms, 1 full bath, full kitchen and plenty of space to sleep more if necessary. You would be located on a 4 lake chain which totals over 2,000 acres of water. There is also a 5th lake that you have access to with a canoe or kayak. If fishing is your ideal way to spend a day, you will be extremely impressed with these lakes. There is also plenty of water for recreational enthusiasts. There is abundant wildlife in the area including deer, bear, bobcat, fox and there is even an area on the lake that is protected where every year an osprey family hatches their young. The lakes have a very nice “pride of ownership” feel to it. As an example, every 4th of July, the property owners get together and decorate their pontoon boats for a boat parade around the lakes. There is also a very active Lake Association that you can choose to join. The Association takes great pride in preserving and protecting the water quality and overall experience that property owners have enjoyed for many years. Besides the awesome cabin and lakes there are also plenty of other things to do right out your back door. Being located in the middle of a National Forest has its benefits! You can hop on your ATV or Snowmobile and ride miles of maintained trails or take a hike in the forest. Enjoy a traditional Wisconsin Friday Fish Fry at one of the many local restaurants followed up with an evening sunset boat ride. Everything you need and desire is within reach here. This type of property does not come around often. It truly offers everything a person would want in a vacation property. If you are ready to start enjoying your summers again, we would welcome the opportunity to share this “once in a lifetime” property with you. Please let us know if you are interested and we can send you more pictures, lake reviews, maps, and any other information you might need.